Author’s note: The manuscript of my book, Summer in the Waiting Room: How Faith, Family, and Friends Saved My Life, is divided into three parts. The title of Part 2 is The Waiting Room. Excerpt #43 is the second installment of The Waiting Room. Sandra started the morning on Friday, June 18, 2010, feeling good about my prognosis. I was still in the ICU, but I slept through the night breathing well, and it seemed like I was on the proper regimen of medication to manage my congestive heart failure. Erica was in Washington, D.C. with her class for the school’s annual trip for incoming 8th graders, so it was just Sandra and Marisa at home. They slept together in the master bedroom to comfort and support each other. In addition to managing my health crisis, Sandra was preparing to close school for the summer and planning for the new school year. She was exhausted as she stepped into the shower and absorbed the soothing water raining down on her. She felt uneasy about going home for the night and leaving me in the hospital alone, but did so at the urging of family, friends, and doctors. As a woman of faith, Sandra was confident that I would be just fine in God’s hands. When Sandra got out of the shower, the phone started ringing and Marisa, recognizing the caller ID, told her that someone from Kaiser was calling. Sandra said “it’s probably daddy calling to say good morning” and quickly answered the phone as Marisa watched nervously assuming the worst had happened. Sandra ended the call after a few minutes of intently listening and responding with one word answers. She told Marisa that something had happened earlier in the morning. The doctors had stabilized the situation, but she and Marisa needed go to the hospital right away. They were soon on the familiar route to the Kaiser Santa Clara Medical Center – Highway 101 to Interstate 280 to Lawrence Expressway – when the hospital called again. Activating the cell phone’s hands-free device, Sandra placed the call on speaker phone so both she and Marisa could hear the caller. Again, it was a doctor from the hospital providing more information about that morning’s episode. Another blood clot formed on an artery and I had gone into cardiac arrest. Once stabilized, doctors were getting me ready for another angioplasty procedure. The doctor told Sandra and Marisa that they would be able to see me before I went into surgery. While Sandra called her mom to let her know what was going on, Marisa anxiously sat through the long ride to the hospital. My body had a negative reaction to Plavix, a common blood-thinning medication prescribed after the first surgery. It wasn’t working, so a blood clot formed on the metal stent doctors placed in my heart almost immediately. This is a rare occurrence caused by the body’s rejection of the medication. By the early morning of June 18th, the clot had closed off the blood flow to the heart’s lower left chamber causing my heart to pump furiously in its efforts to deliver oxygenated blood to the body. Within seconds of the closure in the artery, my heart raced to 280 beats per minute, alarmingly above the average heart beat of 65 beats. In less than a minute, I went into cardiac arrest. Cardiac arrest is a medical way of saying that the heart stops beating. Without blood circulation and delivery of oxygen to the body and brain, the patient loses consciousness. On a heart monitor, the normal peaks and valleys of a heartbeat suddenly turn into a flat line. If cardiac arrest goes untreated for more than five minutes, the lack of oxygen could cause death or, if the patient survives, severe brain damage. The best chance of survival requires immediate cardiopulmonary resuscitation (CPR) and the use of an automated external defibrillator (AED), the electronic paddles that shock the heart so it could start beating. Unless someone nearby is trained in CPR and an AED is readily available, the chance of survival for someone who suffers from cardiac arrest is remote. I was fortunate to be in the hospital ICU when my heart began to race uncontrollably then suddenly stopped. My memory of that episode is brief, but harrowing. It seemed like one minute I was watching the NBA Finals with George, and the next minute I was sitting up in the bed violently screaming for help because I couldn’t catch my breath. Dr. Stephen Fisk, a short and slender pulmonary doctor in his late 60s with gray thinning hair and a trimmed white beard, was trying to calm me down by telling me to relax so he could help me. The fear of dying entered my mind for the first time as the doctors and nurses hovering around me looked concerned and even scared themselves. As Dr. Fisk urged me to relax, I noticed a nurse standing calmly at the foot of the bed with a soothing smile telling me, in a soft but audible voice that could be heard above the bedlam, that everything was going to be okay and that I would be fine. The nurse looked exactly like my sister Patty who had died of a heart condition seven years earlier. A sudden warmth and comfort came over me as the madness around me disappeared and I peacefully fell asleep. SPECIAL NOTE: To accommodate your Thanksgiving Week schedule, Summer in the Waiting Room: How Faith, Family, and Friends Saved My Life is posted today instead of Wednesday. Author’s note: The manuscript of my book, Summer in the Waiting Room: How Faith, Family, and Friends Saved My Life, is divided into three parts. The title of Part 1 is The Giant Dipper (https://esereport.com/2013/12/04/summer-in-the-waiting-room-how-faith-family-and-friends-saved-my-life-prologue/). The following excerpt #41 is the final installment of The Giant Dipper. Although I felt miserable and frail, I didn’t want to go back to the hospital. I knew the routine: ER technicians and nurses would put a hospital gown on me in the emergency room, stick IVs into my arms, insert a catheter into my urinary tract, and paste electrodes to my chest to monitor my heart. Doctors would come in, do some tests, and admit me. So I tried to remain composed and I breathlessly made it through dinner. After dinner, Pancho stopped by to see me, only to watch me cough up blood-soaked phlegm and struggle to breathe. I started to feel tightness in my chest so Sandra finally demanded that I go to the emergency room. The girls were worried and also insisted that I go to the hospital immediately. Sandra, the girls, and I climbed into Sandra’s silver Ford Explorer for the short ride to Shelley’s house to drop off the girls. It was like déjà vu all over again. Sandra and I continued on to Kaiser Santa Clara Medical Center. The drive to the hospital was filled with fear and anxiety for Sandra. I slipped two nitroglycerin pills under my tongue to sooth the tightness in my chest. I began to fall asleep during the ride, probably due to the codeine in the cough medicine I had been taking all day. Sandra thought I was losing consciousness and screamed at me to stay awake and shook me to keep me from passing out while she sped down the freeway. I remember little of that ride, other than the warm and comfortable feeling of falling into a deep sleep and hearing Sandra’s voice in the distance begging me not to fall asleep. When we arrived at the emergency department, a nurse with a wheelchair waited for me at the curb. Sandra jumped out of the car and helped the nurse hoist me onto the wheelchair for the sprint to the emergency room. It was just after midnight on June 17th. While I lay on a gurney in one of the individual emergency rooms for the third time in less than 10 days, nurses began to follow the emergency room procedure I had come to know all too well. My vital signs were worse than the last two visits to the ER: blood pressure, 72/48 and oxygen saturation, 88%. An initial X-ray showed that I had patches in my lungs, beginning signs of pneumonia or worse. This was something new. ER doctors stabilized my condition and admitted me into the hospital for more tests. A few hours later, my gurney rolled into the ICU. 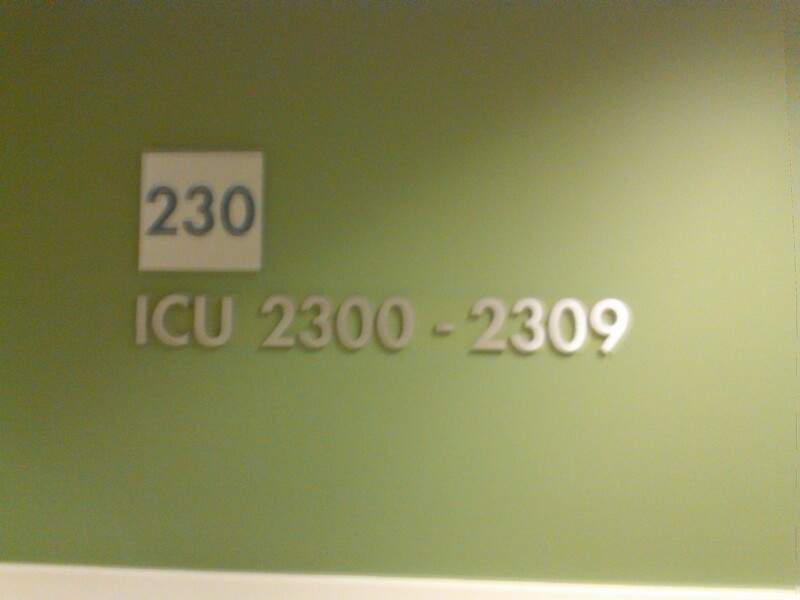 I was scared as I read those words on the wall to the entrance of the unit. I was clearly in trouble, and it was apparent that the doctors didn’t know how to fix whatever was ailing me. Marisa and Erica, the Peraltas, Rochas, Leyvas, Velez, Medinas, and Rudy stopped by to see me throughout the day. During the evening, doctors came in to tell me and Sandra that my heart was very weak and not pumping efficiently. The CHF (congestive heart failure) that caused my last visit to the ER wasn’t getting better. Once the right combination of medication was identified, they said, my heart would work better and management of CHF would be more productive. Just before bedtime, George stopped by to see me for about an hour. We watched the Boston Celtics and Los Angeles Lakers duke it out on TV in Game 7 of the 2010 NBA Finals, and we laughed, joked, gossiped about local politics. Neither one of us mentioned anything about the work at the office. When he left, Sandra came in to tell me that I needed to have faith because God had a plan. She knew that I would recover and everything would be okay. We prayed and hugged and kissed before she left for home for the night. Although weak and tired, I felt optimistic and decided, for the first time in my life, to put my destiny and life completely into God’s hands. I turned on my side, tried to fluff up the hard hospital pillows, closed my eyes, and fell into a peaceful sleep. The last 10 days had thrown my life into a tailspin. I had ridden the Giant Dipper of life for 46 years and survived all of the ups and downs, and twists and turns that the wild ride had to offer. The path included an idyllic childhood, promising high school years, failure in college and an alcohol induced fall from grace, a hard won comeback to graduate from college, build a family and achieve some success in business and public service, and finally a deep dive caused by a health crisis. Surely, I had to be at the bottom of the violent dip, but as I slept comfortably in the Kaiser Santa Clara Medical Center ICU, little did I know that I was only part way down the Giant Dipper’s famously ferocious plunge. Next Wednesday: Summer in the Waiting Room: How Faith, Family, and Friends Saved My Life continues with Part 2: The Waiting Room. Author’s note: The following passage is the 40th excerpt from Summer in the Waiting Room: How Faith, Family, and Friends Saved My Life. The next morning, I felt a little bit better despite developing a persistent dry cough, which was more of a nuisance than anything else. I also felt like I would get back to normal eventually. After breakfast, I sat up in bed and started making phone calls to friends, political colleagues, and co-workers. My office mates were going to stop by the house to see me, so I decided take a shower, which proved to be a difficult and energy intensive task. Walking gingerly into the family room with a wet towel and dirty pajamas tucked under my arm to take to the clothes hamper in the garage, I could see that Sandra wasn’t pleased. In a serious and agitated tone, she told me that I was doing too much, too fast, and she wasn’t comfortable with the office team visiting. I told her that I felt fine, and that just a few minutes with the team wouldn’t hurt. I would take the next three weeks to recover and build up my strength. My relationship with God was off to a good start in the emergency room, but it would take a while to fully form. Back at home, it took a couple of steps back. I thought I had beaten the odds and once again was in control of my own destiny. It was good to see my colleagues when they came to visit. They each looked shell-shocked, not sure what to say or how to react when they saw me. One of them later remarked that it looked like I was “putting on a show” to let everyone know that I was okay. After some small talk about how I was feeling and my experience at the hospital, I immediately held an impromptu staff meeting. The meeting didn’t last very long because, as a few colleagues told me a year later, the situation was awkward due to the tension everyone was feeling from Sandra. She clearly wasn’t happy about me trying to do business as usual. Exhausted, I ambled back to the bedroom to continue the pattern set the day before: sleep, medication, salt-free food, sleep, repeat process. The persistent dry cough intensified so I called the advice line at Kaiser seeking relief. The nurse indicated that some patients with heart conditions like mine were allergic to a specific medication prescribed to manage blood pressure levels. After consulting with my cardiologist, the nurse provided an alternative blood pressure medication to alleviate the cough. It didn’t work. By bedtime, the dry cough had developed into a hacking cough that produced pink frothy phlegm and kept me from sleeping through the night. I explained that I felt fine other than the cough. Despite my protests, the clinic doctor sent me to the emergency room where doctors immediately stabilized my blood pressure and oxygen levels, and re-admitted me to the hospital. It was almost exactly 48 hours after I was discharged. After a battery of tests, the diagnosis was clear to doctors. I had a condition called congestive heart failure, otherwise known as CHF. The damage caused by the heart attack on June 7th was so extensive that the ejection fraction of the lower left chamber of my heart was well below the normal 55-65%. In other words, my heart wasn’t strong enough to pump sufficient oxygenated blood into the body. The pool of blood left in the lower left chamber began to back up causing gooey build-up in the lungs. I was drowning in my own fluids. This explained the low oxygen saturation level and coughed-up pink discharge. The medication prescribed to make my heart work more efficiently wasn’t working so the doctors adjusted certain medications, removed some, and added others to get the right mix. A nutritionist, psychologist, and pharmacist visited me to discuss the importance of eating a salt-free diet, managing stress, and taking medicine exactly as prescribed. I had a better understanding of the physiology of CHF, and a renewed commitment to resigning from the school board and taking the time I needed to heal before going back to work. Three days later, once my lungs were clear and my heart was stable, I was released from the hospital on June 15th. It had been an exhausting eight days. Staying away from the hospital wouldn’t last long. The next morning, June 16th, I again called the advice line because the coughing didn’t allow me to sleep through the night. I was tired, sleepy, weak, and terribly uncomfortable. I was becoming increasingly frustrated and irritated as I coughed incessantly and struggled to catch my breath. The advice nurse suggested that I consult with my doctor to determine what would be best to stop the coughing. I was prescribed cough medicine with codeine to help me sleep. I spent the rest of the day sleeping sporadically, coughing uncontrollably, and spitting up reddish-pink gunk. Next Wednesday: Part 1 of Summer in the Waiting Room: How Faith, Family, and Friends Saved My Life concludes with two more trips to the emergency room in less than three days.